Posted in Backpacking & Trekking and tagged Tetons, Wyoming on March 30, 2010 May 19, 2013 by Jack Brauer. 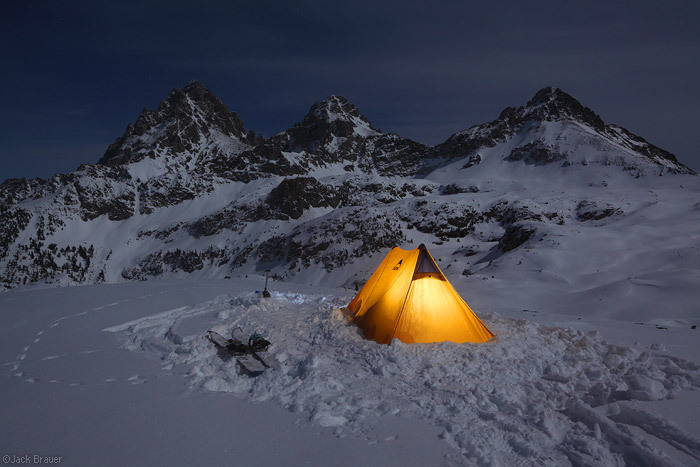 On Thursday I went on an overnight winter camping trip up on Table Mountain, on the west side of the Teton Range. 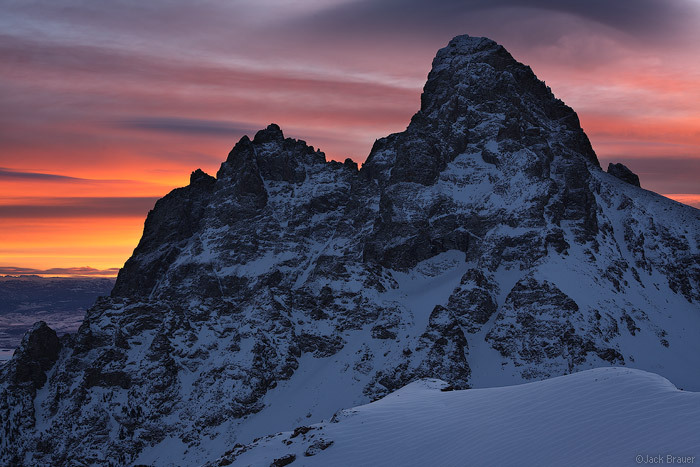 This mountain offers a relatively safe ridgeline route to the summit, and an excellent in-your-face view of the Grand Teton. Posted in Backpacking & Trekking and tagged Tetons, Wyoming on January 30, 2010 May 19, 2013 by Jack Brauer. 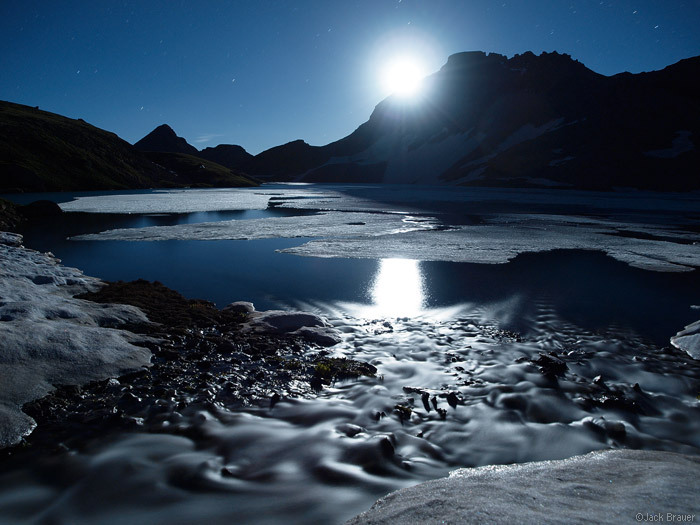 The rising moon casts lunar alpenglow on the peaks of Ice Lakes Basin in the San Juan Mountains of Colorado on this chilly November night. The 30-second, high ISO exposure enhanced the light and stars beyond what our eyes could see. 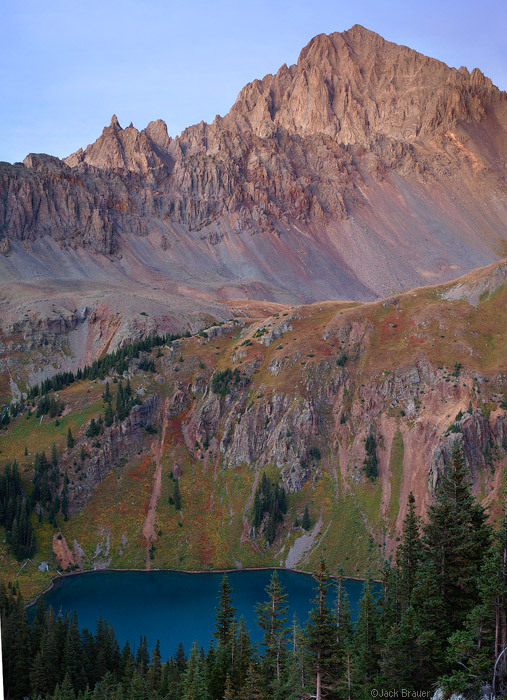 On Thursday I headed out backpacking to Ice Lakes Basin, near Silverton, Colorado. This previous week there has been a high pressure system over Colorado, with warm temps and clear skies, so I figured it would be a good time to head up into the high country for a quick overnight trip. The trail up to Ice Lakes Basin generally faces south, and I enjoyed a dry trail most of the way to the lower basin, and even after that the snow was only shin deep at most. With no snowshoes or snow-boots required it was like winter camping but easier! I found a nice little flat spot near the lake and set up my tent. I knew the post-full moon would be rising an hour and half after sunset, so I hiked around looking for a good vantage point of the basin, set up my camera, and waited in the dark. While I was waiting I was having fun experimenting with my new camera setup – a Canon 5D2 with tilt/shift lenses. This camera has better high ISO performance than any other camera I’ve used, so it was fun to be able to take photo of the stars and the Milky Way. The moon rose on time, providing some nice lunar alpenglow on the peaks with the stars above. The photo above was a 30 second exposure at f/4 and ISO 2000, with the 24mm t/s lens. 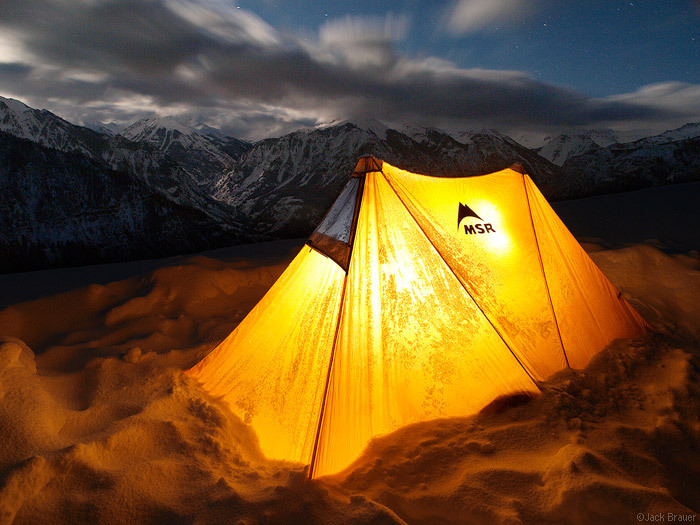 Here’s the obligatory illuminated tent shot! Even though I was warm and cozy inside in my -30º sleeping bag, I hardly slept a wink due to the erratic gusty winds all night. 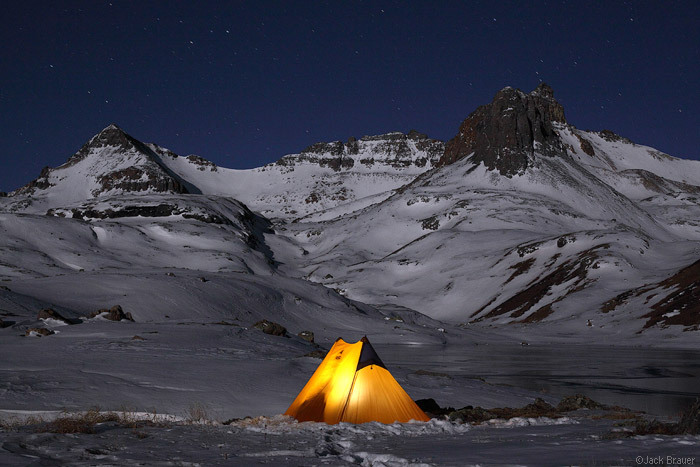 The wind must have been coming in pulses, or else it was swirling around like mad in the basin, because it would be calm and quiet, then a blast of wind would pound my tent, over and over again every 30 seconds or so for the whole night. I knew the tent was fine, but still the noise was disconcerting enough to keep up awake most of the night. 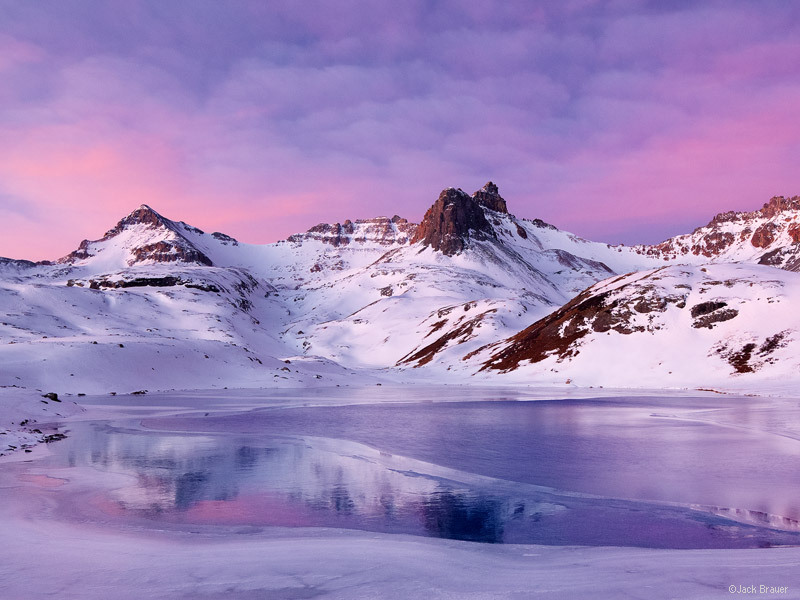 A gorgeous sunrise over snowy Ice Lakes Basin, November. This was right before sunrise. I was stoked to see clouds in the sky after a week of bluebird days. As for the new camera, so far so good! Everything seems to be laid out nicely, and it seems to do what I expect it to do. But most of all, the lenses I got are sweet. I’ve said it before on this blog, but I am a sucker for good lenses, and the whole reason I decided to get into the Canon system was for their new tilt/shift lenses. Being able to carefully shoot a full-frame dSLR with lens movements makes it feel much more like shooting the 4×5 field camera; I can be ultra precise with the focussing from near to far in the scene. Also, I can easily make two-frame panos by taking two exposures with the lens shifted to either side; then the two exposures can be placed together almost perfectly, with no software stitching required. The first shot above, in fact, was made with two exposures with the lens shifted vertically. Anyhow, I’m sure I’ll write more about this camera setup later on when I know it better, but for now I can say I’m happy with it and will probably be using it for a while. Posted in Backpacking & Trekking, Colorado and tagged Colorado, San Juans on November 6, 2009 November 25, 2013 by Jack Brauer. Over three days and two nights this last weekend I went on a ~25 mile loop hike from Cedar Mesa in southeastern Utah. I hiked down Todie Canyon, to Grand Gulch, then out Bullet Canyon. 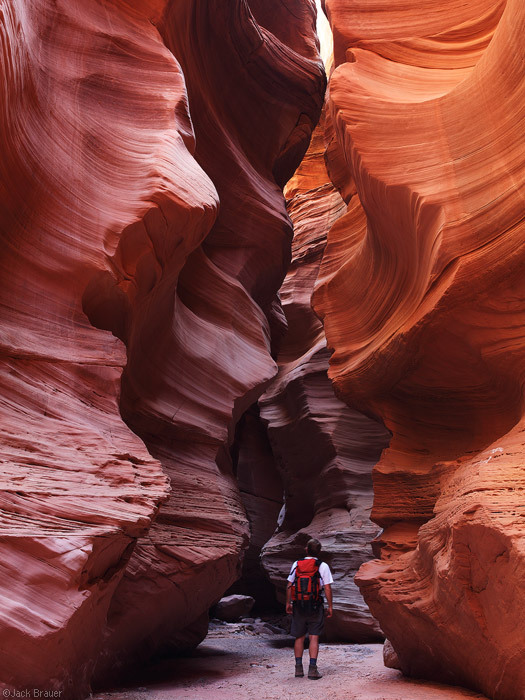 Most of the way the hike passes through dramatic canyon scenery with vertical cliffs and dramatic rock formations. But the highlights were without doubt the numerous ancient ruins and pictographs along the way. Check out all the photos from the Grand Gulch trek on my gallery site. 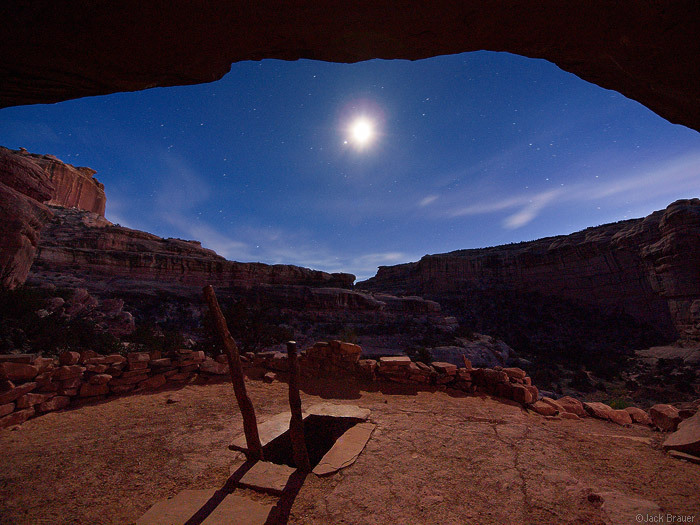 Posted in Backpacking & Trekking, Deserts & Canyons and tagged Cedar Mesa, Utah on October 28, 2009 May 19, 2013 by Jack Brauer. On Saturday I went on a quick overnight backpacking trip to Blue Lakes, under Mt. Sneffels. I’ve been to Blue Lakes before in May, with the peaks and lake smothered in snow, and I’ve been there in the summer, with the wildflower fields and lush green tundra. But I’ve never been there in September, and I was amazed at the beauty of the multicolored autumn tundra. It was also great to get back up into the San Juans again after my last few weeks of laziness (and after my six weeks abroad before that). There’s something indescribable about these mountains that I just love so much. It’s hard to put my thumb on any one thing, it’s more just a feeling I get when I’m here. Perhaps I’ll try to explain this in some future rambling post. After a fun evening of photography, I was then treated to an freakish all-night-long thunderstorm. The photo above is a stacked exposure of six shots, taken during five minutes at sunset. 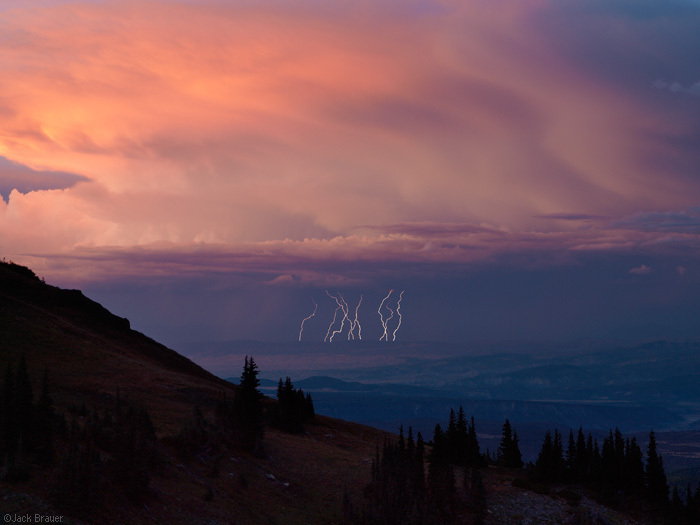 This same storm moved up into the mountains around my camp soon afterwards; imagine the nearly constant bolts like in this photo, but all around me in the high mountain basin! I didn’t sleep hardly a wink, but it certainly made for a memorable night! Posted in Backpacking & Trekking, Colorado and tagged Colorado, San Juans, Sneffels on September 13, 2009 June 10, 2013 by Jack Brauer. I was fortunate to be able to squeeze in one last backpacking trip this week before I take off for Norway on Saturday. 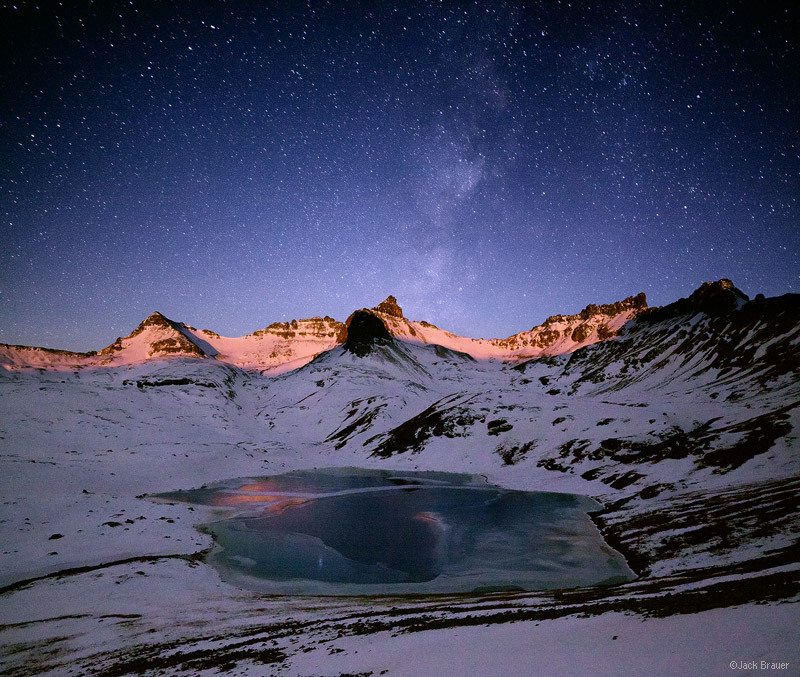 I camped up at Columbine Lake, a high alpine lake situated at 12,685 feet elevation, among the rolling tundra in the mountains between Silverton and Telluride. Though just a quick one-night trip, I had a lot of fun shooting photos and I think I came away some good ones. I am getting really excited for my trip to Norway, but it’s still tough to leave Colorado right as it’s getting into the beautiful summer primetime here. >>See more photos from the Columbine Lake camping trip here! 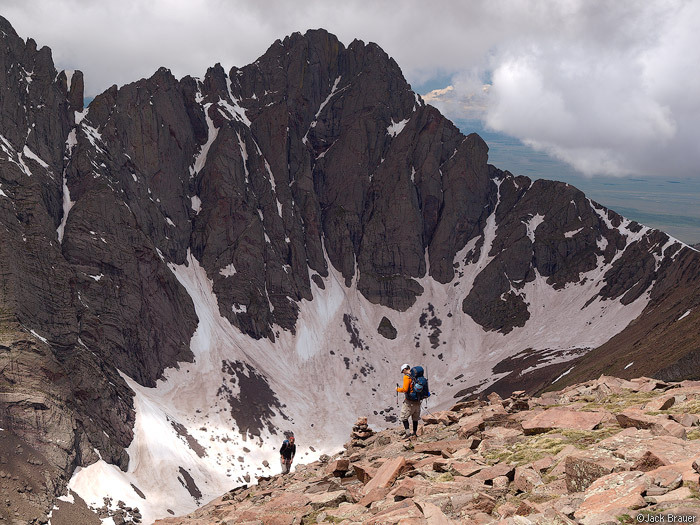 Posted in Backpacking & Trekking, Colorado and tagged Colorado, San Juans on July 9, 2009 May 19, 2013 by Jack Brauer. This weekend I went on a little road trip to the Sangre de Cristo Mountains near Westcliffe, Colorado, to meet up with a friend for some camping and hiking around South Colony Lakes. The lakes are situated at the foot of three 14ers, making them a perfect basecamp for several days worth of hiking. The weather was grim during our first two days, with rain, hail, lightning, thunder, and relentless Patagonia-esque winds. On the third day, however, I woke up at 2:30am to clear starry skies, so I jumped out my sleeping bag, got my stuff together, and started hiking via headlamp up to Broken Hand Peak, hoping to get a sunrise shot of the Crestone Needle fourteener from the neighboring summit. 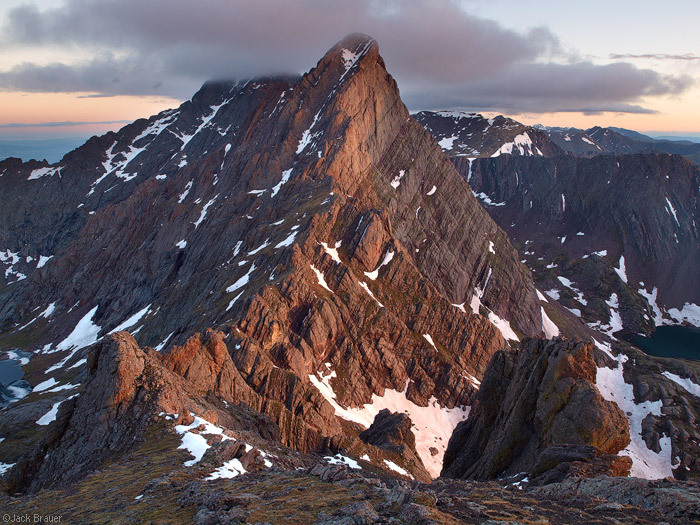 After some tricky routefinding around some cliffs and up some snowfields, I made it to the summit at about 5:00, and witnessed a spectacular sunrise from the top. After the Broken Hand Peak hike, I made my way back down to the lake where my friend was hanging out, and since the morning was still showing great blue-sky weather, we decided to hike up Humboldt Peak, another nearby 14er. Having just climbed one mountain, I wasn’t expecting to immediately go do another one, but I was feeling good and perhaps still had some more pent-up energy after the two previous stormy days. The weather held out, and we got to the summit around 11:30am along with about 20 other happy hikers. See some more photos from the South Colony Lakes trip here. Posted in Backpacking & Trekking, Colorado and tagged 14ers, Colorado, Sangre de Cristos on June 28, 2009 November 10, 2013 by Jack Brauer. I just got back from an overnight spring-winter camping trip on the Bridge of Heaven, a high ridgeline 2600 feet above Ouray with a killer view of the town and the surrounding San Juan Mountains. I’ve been wanting to winter camp up there for almost two years now, but have not had a good opportunity to do it yet. With heavy snows the last two days, and a forecast of clear skies for today, I knew the timing was right to get the shot of Ouray smothered in snow. The fact that I sacrificed two surely epic snowboarding pow days to do this trip shows how much I’ve been wanting to get up there to take these photos. But of course it’s always fun to get out and live in the elements every once in a while too. Posted in Backpacking & Trekking, Colorado and tagged Colorado, Ouray, San Juans on April 13, 2009 May 19, 2013 by Jack Brauer. After three completely sedentary weeks at the computer, this last weekend I was desperate for some wilderness action, so I headed out on a backpacking trip in the Great Sand Dunes. My initial plan was to do a simple three day hike up and back the Sand Ramp Trail along the eastern side of the dunes. But on the first night I was feeling ambitious and decided to hike all the way around the dunes! Read more about the trip below, and be sure to check out my gallery of photos from the trip. 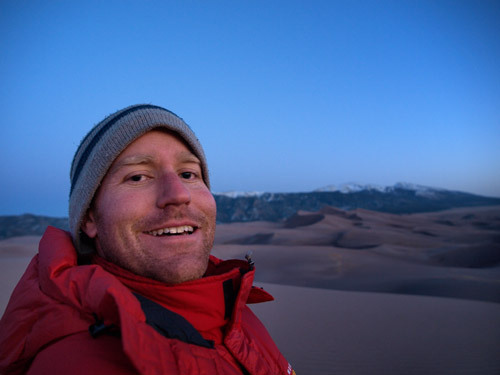 Posted in Backpacking & Trekking, Colorado and tagged Colorado, Great Sand Dunes, Sangre de Cristos on March 18, 2009 May 19, 2013 by Jack Brauer.